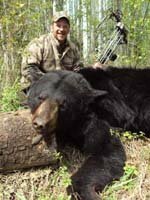 Shadow Creek Outfitters' Bear Hunts are in Wildlife Management Unit (WMU) 540, which has one of the highest black bear populations found anywhere in the province of Alberta, Canada. 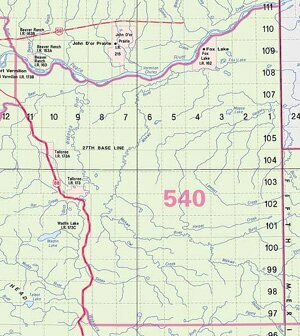 Bordering Wood Buffalo National Park, this very remote area has virtually no resident hunting pressure. Most of this territory has never been hunted. 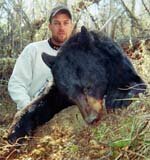 WMU 540 contains black bears of impressive sizes (Green Scored over 23" and up to 600 lbs). Our hunt area is spectacular at this time of year, with the land rapidly changing from the dull brown of early spring to lush green in just a short couple of weeks. 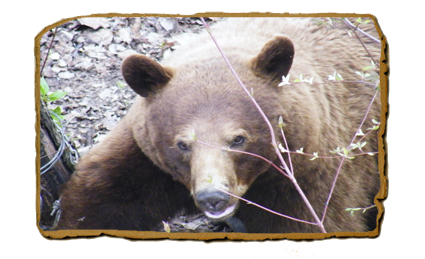 Our Spring Black Bear Hunt offers up to a maximum of 2 bears per hunter with a very high success rate and excellent percentage of color phase bears, ranging from blondes to dark browns. We have over 40 bait sites that are stocked with oats, honey, meat scraps, and beaver. We travel to carefully scouted sites via ATV and boats. The base camp is generally a bush tent camp with bunk beds and wood stoves providing a clean dry setting for yourself and your gear. Bedding can be provided however most hunters like to bring their own sleeping bag (please clarify your needs with us before coming to your Shadow Creek Outfitters hunt). Whenever more than 2 hunters are in camp (we generally have 4 to 6 hunters per camp), we have a cook on staff. 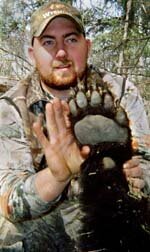 A typical day starts around 9:00 am (0900) with a brunch followed by skinning bears from the previous night. Shadow Creek Outfitters owner, Henry Giles, is happy to help you learn or improve your trophy preparation skills. Serious hunting takes place from 4:00 pm to 11:00 pm (1600 to 2300). Another meal is held shortly after returning to base camp and socializing wraps up around 1:00 am (0100). Our camp is located within a 1.5 hour drive from High Level, Alberta. If you fly to High Level, Shadow Creek Outfitters provides transportation to camp. 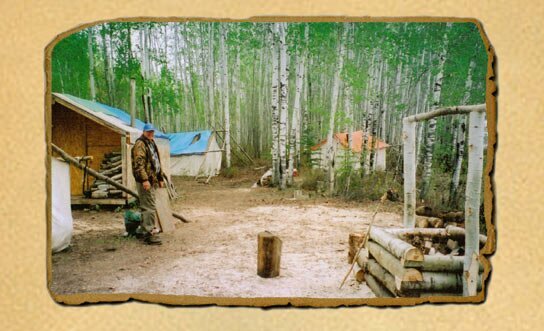 If driving to Fort Vermilion (the town nearest our camp), we will meet you at the staging area and guide you to camp. ** A bison is possible on this hunt for a $1000 (USD) trophy fee if harvested. You will be set up for your hunt and your Guide and/or Outfitter will be in regular contact with you. Most hunters prefer to hunt with guns, but others have completed successful hunts with both cross-bow and spear.